In the past few week, China intraday lending rates as measured by SHIBOR got as high as 25% (See China Cash Crunch: 1-Day Interest Rate Spikes to Record High 25%). With rates spiking, global stock markets plunged. On Monday China insisted banks had significant liquidity sending a message that banks need to manage their own risks. A translated message by the People's Bank of China on liquidity states "Commercial banks should concentrate storage for taxes and statutory reserve deposit and other factors impact on liquidity in advance to arrange sufficient positions to maintain adequate levels of reserve ratio, to ensure the normal settlement" while warning "expansion of credit and other assets too fast may lead to liquidity risk". 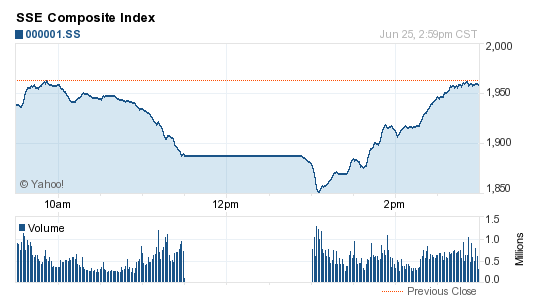 That message sent the Shanghai stock market index down about 6% as shown in the following chart. The horizontal line represents a split shift when the stock market is open. 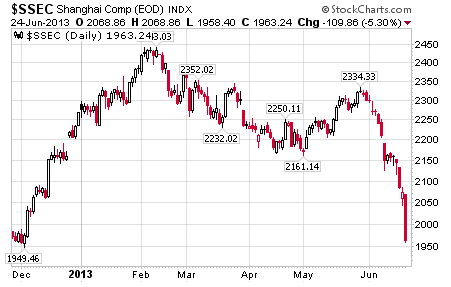 Since the beginning of June, the Shanghai stock index is down about 15%. Since the February high of 2443, the market is down nearly 20%. Intraday, the market was down over 25% from the year's high. Mid-day, Tuesday, the China central bank decided it could take no more, and that's when the market rally took place, erasing nearly all of the 6% intraday drop shown in the first chart. The Financial Times reports China in fresh effort to calm shaken markets. China has pledged to backstop banks suffering from cash shortfalls, giving rattled investors hope the country’s money squeeze could be nearing an end. The statement by the People’s Bank of China on Tuesday was the clearest attempt yet by the government to calm the turmoil that has shaken global markets over the past week and fuelled concerns that the world’s second-biggest economy could be on the verge of a credit crisis. In its latest statement, the central bank said money markets were already on the mend after interbank rates spiked to double digits last week. It noted that the overnight bond repurchase rate had fallen to 5.83 per cent, more than half what they were last week, though still about twice as high as normal. “Several strong banks have already started to play an important role in providing funds to the market and stabilising interest rates,” it said. A commentary earlier on Tuesday in the People’s Daily, official newspaper of the Communist party, called on authorities to continue an unyielding stance. “The central bank is not a wet nurse to the stock market. If it saves the stock market, it will in fact be harming it,” the paper wrote. In theory the central bank could paper over this mess with massive amounts of liquidity, but in practice, such action will either further fuel China's immense structural problems, or more likely, the credit bubble in China has gotten as big as it is going to get, no matter what the Central bank does. The world is not remotely prepared for a major slowdown in China. Yet, China's credit bubble has popped, and growth going forward will plunge as China rebalances.